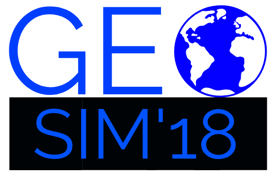 The GeoSim’18 workshop focuses on all aspects of simulation as a general paradigm to model and predict spatial systems and generate spatial data. New simulation methodologies and frameworks, not necessarily coming from the SIGSPATIAL community, are encouraged to participate. Also, this workshop is of interest to everyone who works with spatial data. The simulation methods that will be presented and discussed in the workshop should find a wide application across the community by producing benchmark datasets that can be parameterized and scaled. Simulated data sets will be made available to the community via the website. The workshop seeks high-quality full (8 pages) and short (4 pages) papers that will be peer-reviewed. Once accepted, at least one author is required to register for the workshop and the ACM SIGSPATIAL conference, as well as attend the workshop to present the accepted work which will then appear in the ACM Digital Library.